So how are the defending Super Bowl champs doing this season? An hour ago, things looked pleasantly optimistic! But, this instant… not so well. The Eagles led today’s home game 17-0 going into the fourth quarter. Then they gave up three touchdowns and lost to the Carolina Panthers, 21-17. Cam Newton threw a pair of fourth-quarter touchdowns, including the game-winner to Greg Olsen with 1:21 to play. 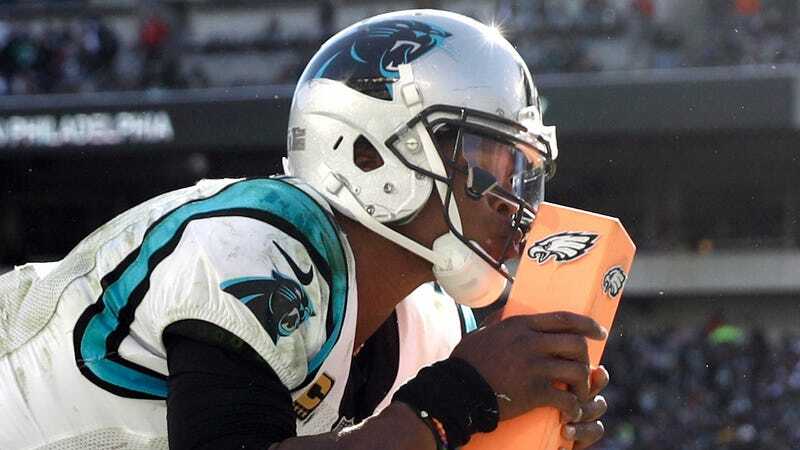 The Eagles had a chance to win it after a pass interference penalty gave them a first down at the Panthers’ 22 with just over a minute to play. The team’s hopes even survived an overturned Eric Reid interception, but Carson Wentz fumbled on fourth down, now the Panthers are 4-2. This did not look like a game the Panthers were going to win. They punted on their first second-half possession, and then the Eagles put together a 17-play, 94-yard drive that took 9:22 of the clock and ended with a Wentz TD pass to Dallas Goedert. The Eagles were up 17-0. The game was in hand. The Panthers scored on their first three possessions in the fourth. It looked like the Eagles were going to pull it out as the Panthers faced fourth-and-10 at their own 31, but ex-Eagles receiver Torrey Smith caught a 35-yard pass. Carolina took the lead six plays later, and wouldn’t lose it. This season, Philadelphia has lost two games in which it held double-digit leads in the second half. They’re now 3-4. Crap. What If The Eagles Just Stink?